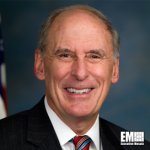 National Intelligence Director Dan Coats has said the U.S. needs to ramp up efforts to maintain its technological edge as several countries develop anti-satellite systems, space-based navigation and surveillance platforms that could potentially challenge U.S. space dominance, SpaceNews reported Wednesday. “We have to up our game if we’re going to stay competitive… We have to become much more agile, more innovative, more creative,” Coats, a 2018 Wash100 recipient, told reporters during a breakfast meeting Wednesday. He said space has evolved into “an ever more important domain” and that several countries such as Russia and China have initiated efforts to develop space capabilities based on a threat assessment report the Office of the Director of National Intelligence released in February. “That includes anti-satellite capabilities. We track that very, very carefully,” Coats added. He noted about the Defense Department‘s role in the establishment of a new space force and that the creation of such a military branch should be based on national security requirements.